In recent decades America has fallen victim to the ‘save now, pay later’ mentality. Cheap, fast food that wreaks havoc on our bodies and leads to sky-high healthcare costs is a prime example—costs spared on one’s grocery bill will surely end up on one’s medical bills. Full-time workers who are overweight or obese and have other chronic health problems cost employers more than $153 billion in lost productivity each year. At the individual level, an unhealthy employee could cost up to twice as much as a healthy employee. When it comes to your bottom line, business owners have no choice but to pay attention. Employers and CEOs are moving beyond the aforementioned short-sighted mentality and demonstrating their belief in the phrase ‘a business is only as good as its people’ by investing in their employees’ health through workplace wellness initiatives. Some corporate wellness programs see $3-$4 return on every $1 invested. But what makes for an effective corporate wellness program? All good intentions are out the window if a program isn’t properly implemented or doesn’t target crucial health metrics. Ease of implementation. Most businesses don’t have the time, resources, or employee motivation to maximize the benefits of intensive programming. A custom, turnkey, targeted wellness tool that takes the work of developing and managing a complex platform off the plates of HR Directors and Benefits Managers is crucial. Nutrition-focused. 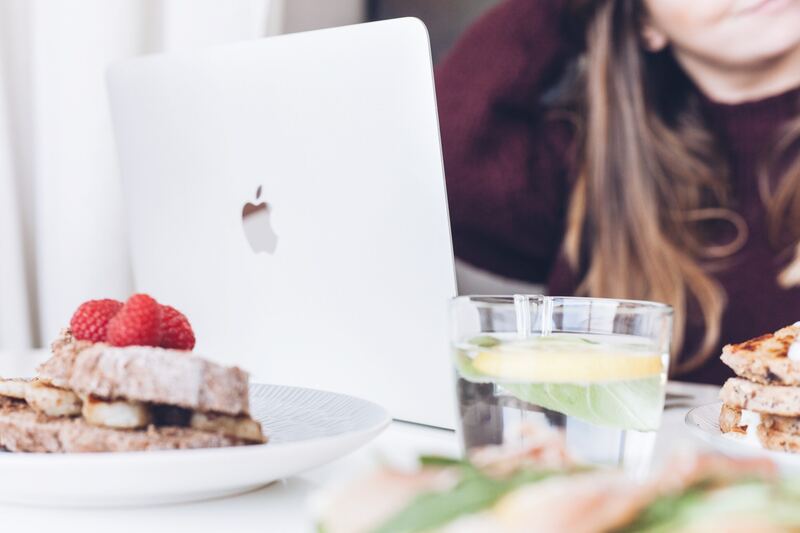 Most ‘wellness’ solutions that come across your desk don’t address the core problem—better employee health begins with better food choices each day. Exercise is a key piece of the puzzle, but we are what we eat, and good health and weight ultimately begins and ends with what’s on our plates. Fun, engaging, and judgement-free. Discussing diet with employees is often considered to be taboo, so how can a company broach the topic of healthy eating successfully? Involving everyone in a unified goal and taking the focus away from weight loss creates a positive, universal and level playing field upon which the entire team can actively engage in developing healthy eating habits to improve their health—regardless of one’s starting point. A unique solution has been developed using these very principles alongside the latest in behavioral medicine and nutrition—Foodstand’s Team Challenges empower people to make healthy habits an everyday behavior, and build the ‘rules for good eating’ joyfully into daily life. The healthy eating behavior-change platform is mobile-first and allows entire teams to work together to pursue progress over perfection using easy tracking. With an up to 95% completion rate, Foodstand’s bite-sized Challenges are sustainable long term to enable lasting change, helping to keep your company healthy 365 days per year. Foodstand’s detailed weekly reports reveal trends, behaviors, outcomes, retention and more—saving you time and headache, while providing your company with full transparency. Nutrition education, guidance and inspiration for your staff allows them to focus on the eating habits that will improve key metrics—generating measurable health improvement and cutting your costs. Workshops, intra-office competition and personalized reporting foster team building, mutual support and interaction—the social accountability a program needs for sustained engagement and company morale. Pave a new path in comprehensive employee wellness by enabling a healthy, achievable, sustainable lifestyle for your employees that’s no-hassle for you. This ‘save now, save later’ endeavor is helping to develop and revolutionize an industry, and keep money in your own pocket. The health of your employees and your business are worth the investment. Click here to learn more about bringing Foodstand’s Team Challenges to your business. A company’s most valuable asset is its employees, and employee health is the top indicator of employee productivity. Yet more than a third of adults are obese, putting them at a higher risk for heart disease, cancer, and type 2 diabetes, and significantly compromising their output. Full-time workers who are overweight or obese and have other chronic health problems cost employers more than $153 billion in lost productivity each year, and without the benefit of scale, small businesses are especially affected by unhealthy employees. 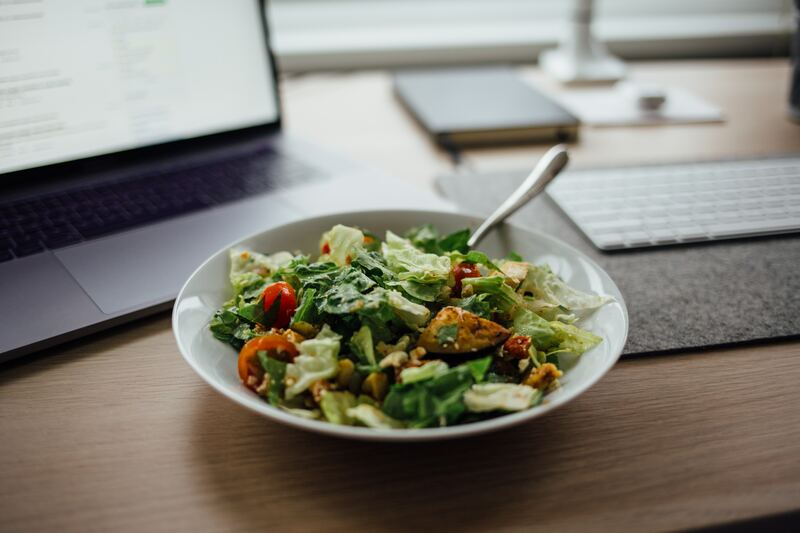 Thankfully, good health is 80% what we put on our plates and into our bodies, and improving employee health through healthy eating habits can noticeably improve workplace productivity and maximum output. Here are five rules to help you get started! Keep a water bottle handy at all times. Buy reusable ones, slap on your company stickers—whatever it takes to make it your third arm. Often a well-loved bottle is all it takes to stay hydrated, but if some extra inspiration is required, try tossing in chopped fruit or herbs. Some tasty combinations are: watermelon and mint (or cucumber), lemon and basil, orange and mango, and lime and ginger. Why choose tap or sparkling water over soda or energy drinks? Water doesn’t contain any added sugar which can kill productivity when the dreaded “sugar crash” strikes. The crash in-turn triggers cravings for more sweet stuff, cascading into a death spiral of lost productivity. Soda has double the amount of sugar that one should consume in an entire day, quickly converts into fat, can lead to feeling sluggish, cause cavities (who can afford to lose [wo]man power to a day at the dentist?! ), and can increase one’s risk of chronic disease—all costly to a business. Coffee is delicious, but too much is dehydrating and causes the jitters, which impacts productivity (and with back-to-back coffee meetings throughout the day, the cups add up!). Swap coffee for green tea after 12pm—it has much less caffeine, which means an energy boost without the shakes. Green tea also has L-theanine, which is beneficial for improving performance on cognitively demanding tasks—clearly a boon for business! It’s easy to grab a muffin in the morning or scrounge together a couple of granola bars or fast food for lunch. But well-balanced meals that include fiber, protein and healthy fats will not only boost energy, they’ll also curb those pesky afternoon cravings that lead to one unintentionally eating an entire bag of Fun Size Twix at one’s desk. Opt for a breakfast that doesn’t contain added sugar, such as plain yogurt with berries and a tablespoon of nut butter. And choose a nutritious lunch (or pack a lunch to save some time) such as an avocado, egg and tomato sandwich on whole grain bread; or a grain bowl with brown rice, roasted veggies, and a small piece of chicken or fish. Whatever one is craving, including at least one fruit and/or vegetable in every meal is crucial to maintaining energy and staying satisfied. 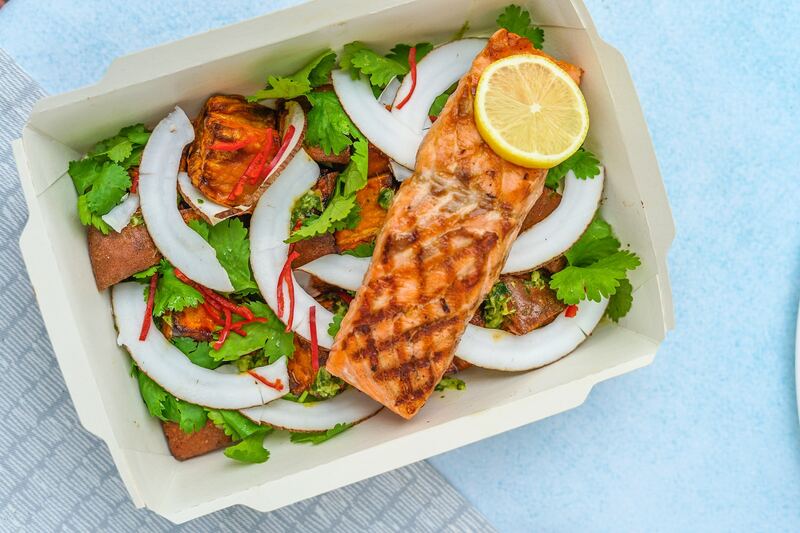 These meals may take a few extra minutes to prepare before coming to work, but that time will be recuperated in added productivity. Sometimes it’s impossible to peel oneself away from the phone or computer. But eating tech-free will provide the mental break needed to stay fresh throughout the day. It will also improve digestion, and enjoyment of one’s meal, leading to fewer cravings during that afternoon slump. Put the phone (and smartwatch) in a drawer, catch up on some reading, or eat with another human being! Taking a few minutes to oneself while eating can work wonders for efficiency throughout the day. Snacking is inevitable, but most office snacks (cue the never ending candy jar) do more harm than good. They are often packed with sugar and calories, and seriously lack nutrients, driving employees to eat more and feel unsatisfied. Swap out chips, sugary cereal, and candy for whole food snacks like fresh fruit, dried (unsweetened) fruit such as mango or pear, raw nuts, raw veggies with hummus, and plain yogurt. Keep the crunch or sweetness, but with the whole-food benefits of fiber and nutrients needed to keep everyone satiated and energized. Ready to incorporate fundamental healthy eating habits like these into your company? Foodstand’s Healthy Eating Challenges for Teams is the custom corporate wellness program that will help you improve employee wellness without putting more on your plate. Foodstand’s platform is fun, easy and achievable—for both employees and HR Directors and Benefits Managers alike—helping your team make healthy habits an everyday behavior, and build the ‘rules for good eating’ joyfully into daily life. Foodstand allows entire teams to work together to pursue progress over perfection using easy tracking, and with an up to 95% completion rate, Foodstand’s bite-sized Challenges are sustainable long term to enable lasting change, helping to keep your company healthy and productive 365 days per year. 4 behavior-change strategies to build a healthy team. A poor diet is the leading contributor to death in the United States—higher than cigarettes, drugs, and alcohol combined. While we know that eating healthfully is important, our system has been built by corporations that profit from selling cheap food that’s packed with junk. Good food isn’t the easier choice because our food environment doesn’t support health. Without a healthy system in place, many employers are trying to improve employee health through worksite wellness initiatives. However, existing solutions have some critical flaws. First, they tend to overemphasize the role of exercise when it comes to chronic disease, obesity and overall productivity. The studies show that good health is only 20% activity-based—the other 80% is all about healthy eating. Second, the worksite wellness initiatives that do target diet focus on counting calories instead of well-rounded healthy eating habits. Additionally, existing solutions are often hard to implement and time consuming for HR Directors and Benefits Coordinators. The science behind effective behavior-change strategies are clear, and are crucial when it it comes to building employee health and wellness. Baby steps—the tortoise wins. Setting an enormous goal may be tempting, but it’s the small, achievable steps and victories that actually create habits and lasting change. Perfect is the enemy of good. Habits aren’t made by throwing in the towel and thinking you’ve failed whenever you take a misstep. In fact, knowing that you can indulge from time to time makes a new habit sustainable long term. Social-accountability. Research shows that people are twice as likely to maintain a healthy habit if they do it with someone else. By working as a team, your employees are held accountable for their new habits, resulting in greater success at achieving good health. Positive reinforcement. Punishment breeds guilt, resentment, and has been proven ineffective at changing future behavior. Instead, congratulating employees with small and frequent reinforcements upon making a healthy choice will result in better eating habits over time. Foodstand is a corporate wellness program designed to help teams build basic healthy eating habits into daily life for lasting change. Its incremental level system with strategic free passes incentivizes your employees with achievable goals, tracking and congratulating their choices to eat the better option, and bringing them together as a team through a unique buddy system. Best yet, Foodstand’s Team Challenges are fun to use, easy to implement at scale, and custom-fit for the unique needs of HR Directors, Benefits Managers, and Wellness Directors—making it more effective. More than a third of adults are obese, putting them at a higher risk of heart disease, cancer, and type 2 diabetes. Since an unhealthy workforce is a less productive workforce, diet-related disease is too important for employers for employers to ignore. An unhealthy employee can cost employers twice as much as a healthy employee. Using the proven science of habit building combined with the latest nutrition research, you can enable your employees to make small changes every day and create new healthy eating habits—the solution to good health, according to nearly all Registered Dietitians.